Thanks Lynx, yeah I just got my camera so I'm not too great with it yet. Here's an updated picture, looks like a nice healthy tooth is coming in underneath. Although it looks so much bigger then the tiny one next to it since that was the only tooth he has been using for awhile. He is off antibiotics now because he started to get diarrhea, but he seems fine and seems to be eating a lot better now that the bad portion of the tooth fell off. Oh, your new pic is great! Very crisp!! Okay with you if I continue adding your updated pics to the board? That would be great Lynx. Yeah I am working on my camera skills, by the time the tooth is completely grown out I should be a pro. Thanks for the hint about the macro button, didn't know what it did. I'll add another picture in a couple of days, should be grown out quite a bit by then. 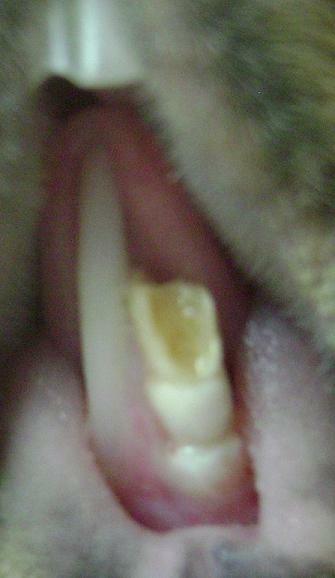 Here's an updated picture of Coco's tooth, now I have no clue whats happening. The new tooth coming in definately does not look normal. Weird tooth. It looks as if it has damage at the root, which is causing the growth to be strange. An xray of that root will give you a better idea. Yeah I'm back home now in a bigger city so I am going to bring him to a vet up here that actually knows stuff and can take a look at his molars too just to put my mind at ease that the rest of his mouth is ok. Just wish I knew how all this happened so I could stop it from happening again, or to any of my other piggies that I ever have. I am guessing it will eventually grow out normally. I'll add this one to the thread too. Well here is the latest pic, I was worried that the tooth was just going to keep coming in all big and in segments but it seems Lynx you were right. Not sure if you can really tell in the picture but under the three segments a new normal looking tooth is coming it. Now I just have to see if he will be able to wear down those big segments or if I will have to get them chopped off. Oh, I see the new one at the very bottom! Your picture is excellent. I hope it continues to grow normally for Coco. Great pic! It is indeed good to see that beneath it all, it seems to be growing out okay. Well Coco's tooth is back at it again. The one bottom incisor is still much bigger than the one next to it, and this abnormality is causing the rest of his teeth to react. I shoved my finger in the back of his throat to feel his molars again, and they seem a little close to each other for my comfort. So I did the same to my other guinea pig Taz as a comparison, they are a little further away, but not much different. Anybody know how much space is actually between one molar on one side of the mouth versus the other? I'll go take another picture of Coco's front teeth and post it in a minute. I have a vet appointment next week, first opening they had that corresponds with my work schedule. He is still eating fine and acting like his usual self. But obviously if that changes I'll have to get him in sooner. I'm even thinking of going and buying some crappy guinea pig food (well its alfalfa based instead of timothy based) that is extruded so he can wear down his teeth more, as that is what he used to eat, until I discovered Cavy Cuisine, but I find it so soft and doesn't really make his teeth work too much. He does get tons of hay though everyday, I dunno, just trying to think of everything. Wish there were more vets who actually had expertise with guinea pigs. As long as they're getting unlimited hay every day the teeth should be getting a good workout. Are they eating enough of the hay you give them? Checking the molars can be tricky, it's hard to tell what's going on by feeling. Usually a visual check is done with a lighted magnifying scope and an x-ray is sometimes necessary to tell what's really going on. It helps to rinse out the mouth first because they tend to store a lot of food in their mouths. Wasn't the problem with Coco's tooth before caused by an abscess under the gum? Hey sorry I was gone for a bit, I've been working quite a bit. His initial problem was an abcess under the gum. He just doesn't chew the same since he had that problem. He used to go through a cardboard tube in a month and now I've had the same one forever. He eats plenty of hay, thats all he seems to do (after he's scarfed down his daily amount of pellets and veggies), but the one front tooth is still really big, its almost like it needs to be filed down to a smaller size so he would be comfortable using it. I guess I am just worried about the molars because I want to figure out why he is still having teeth problems and I heard that molars can cause secondary issues with the incisor teeth. I'm going to go take a picture now to show you all, my camera was dead last time. Its actually improved a bit since my last post but you will see how big the one tooth is. If he's eating a fair amount of hay, his molars must be working. 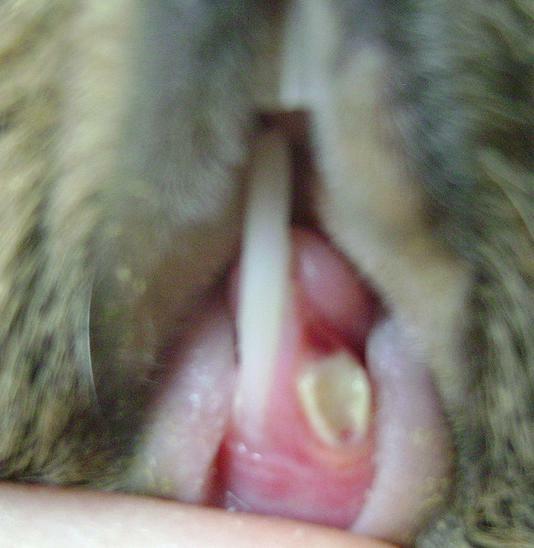 Severe molar problems will cause them to stop eating hay because it hurts to chew. 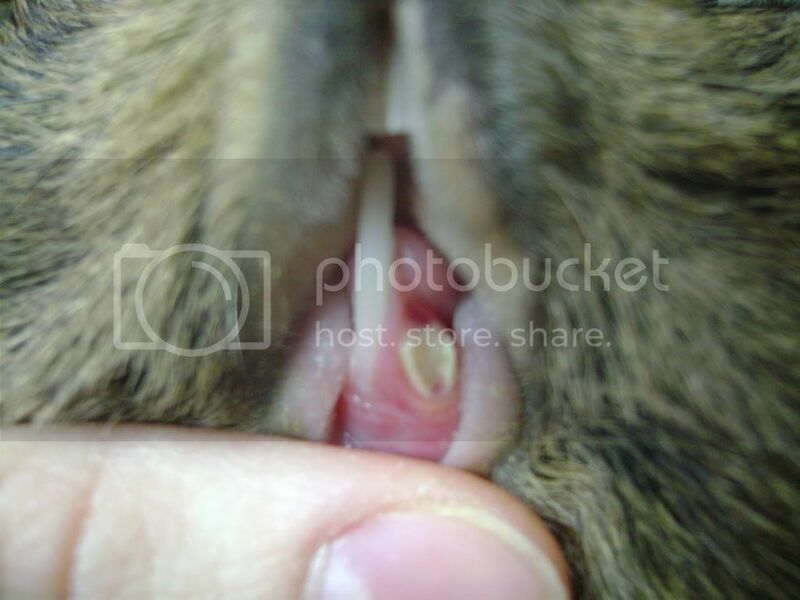 The only way you will know for sure about the molars is a vet exam. My pigs don't eat as much cardboard when they mature as they did when they were younger. I use pressed hay cubes for them to work their incisors with, this is in addition to unlimited loose hay not instead of. Ok, my internet went out when I was about to add the picture, sure took a lot of effort to finally get it on here and its not that great. Yeah I feed them hay cubes as well, he nibbles on it a bit, but its mostly my other guinea pig Taz who eats them. I have a vet exam scheduled for this thursday. 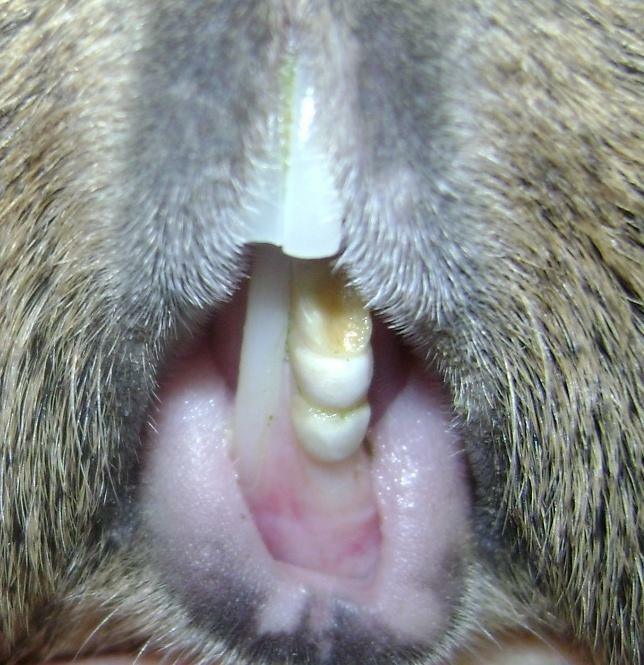 Anybody ever file your own guinea pigs teeth?